Red Chair Pale Ale, or any other beer. "We are excited to let you know that we’ve just launched a delicious new product that will surely make you and the Rambling of a Beer Runner readers’ taste buds tingle with joy!" Unlike most marketing e-mails, Anna said nothing further about what she was marketing and just asked for my addres, so she could ship me this mystery product. "OK, I'll bite," I responded, intrigued with what she was hiding. "What are you talking about here?" Anna coyly responded with, "All I can share at this time is that it will bring snacking to a whole new level and involve bacon!" Given that some very wonderful and truly awful things have been done with bacon, I told Anna I wasn't so sure my taste buds would be tingling with joy, but if she wanted to ship me whatever she was talking about, that was fine with me. I totally forgot about this until a few weeks later, when the mailman delivers this box and inside are couple packages of Oberto Bacon Jerky, a new product Oberto launched this March. Now bacon jerky really isn't something related to beer or running, so why I am a writing about it here? It's because this stuff is seriously awesome. It's tender strips of smokey salty pork goodness that are totally addicting. So Anna, you win. You got me to write about it. Of course, it helped the Bacon Jerky was excellent. While I don't want to turn into a corporate shill, if some person or organization gives me something I like, I want to return the favor and tell others. Perhaps this is part of the wonderful cooperative nature psychologists say are hardwired into our brains to advance the species. Or maybe all this means is bribery is a fact of life and big corporations can get cheap advertising just by handing out free stuff to eager bloggers. You decide. Just know if you want to bribe me, use bacon. We celebrate all things California with our Beer of the Month, Anchor Brewing's California Lager, a beer that is quite literally California history in a glass. The recipe dates back to 1876 from little known Boca Brewery located near Truckee, CA, which used a mountain ice pond to ensure the lager kept cold during the fermentation process. It's brewed with 2-row barley and Cluster hops, a hops varietal you won't find in many beers these days, but it was highly prevalent in during the 19th century. Perhaps the reason you don't see Cluster hops much anymore is that this hop variety has a certain distinctive taste, which Randy Mosher describes in his book "Radical Brewing" as having "a certain sharpness often called cattiness". I have to admit, "cattiness" doesn't sound so good, but I found the Cluster hops to provide a distinctive earthy, grassy, slight herbal finish unlike anything I've tasted in other beers. The Cluster hops meld well with the lightly toasted, slightly sweet biscuit-like malt to create a clean, refreshing, and off-beat lager that grew on me after each bottle. Anchor's California Lager was originally brewed as the first beer of their Zymaster Series in early 2012, and due to its popularity, has been added to Anchor's permanent line-up early this year. Anchor Brewing is donating a portion of the profits of California Lager to create the Anchor California Lager Grant, to be awarded by the California State Parks Foundation as a part of their Discretionary Grants program to benefit state parks. Sure, selling beer is a business. Kudos to Anchor Brewing for preserving California's history and landscape as part of that business. Steve Donohue would be one of those rockstar brewers if he lived in San Francisco or Santa Rosa after winning all those Great American Beer Festival Medals at Firehouse Grill and Brewery. Problem, was Firehouse was located in the far less glamorous towns of Sunnyvale and East Palo Alto, places few beer geeks venture to. Firehouse's management also seemed far more interested in featuring its young, nubile waitresses in short kilts and tight t-shirts to appeal to the sportsbar crowd than being a destination for great beer. Too bad, since sportsbars with pretty girls are a dime a dozen, while Steve's beers were pretty special. 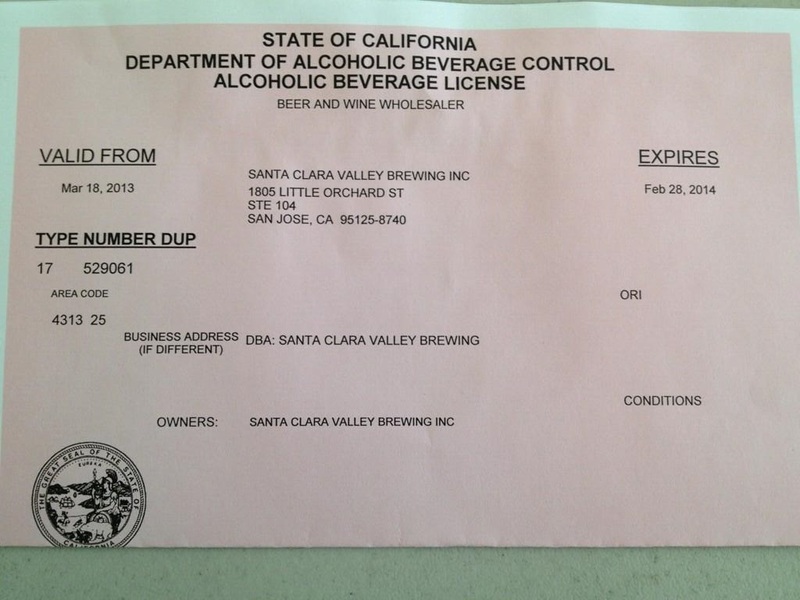 So Steve Dononue left Firehouse to start his own brewery and the good news is that he now has his California Alcoholic Beverage Control Type 17 License (Beer and Wine Wholesaler) which he happily Tweeted to the world March 21st, which allows him to get brewing! How soon can we expect the first beer from Santa Clara Valley Brewing? A recent comment from Santa Clara Valley Brewing on their Facebook page declares "We still have some work to do before we have beer, but we're working on it as much as possible. We're hoping to have beer by early to mid May." I found Steve's beers, like his Hops on Rye, Hall and Oatmeal Stout, and Pete's Support, a nifty Belgian IPA, were always flavorful, unique, and distinctive but never strayed too far from traditional brewing styles. His next beers from Santa Clara Valley Brewing can't touch my lips fast enough. Let's raise our glasses to the success of yet another great South Bay Brewery. The idea behind infusing vodka with orange peel was a nod to Newport's Irvine, CA headquarters in Orange County. The orange oils and flavors were a bit buried in this porter, which leaned heavily on the roasted side of the style. The end brew was very roasty, with coffee-like flavors but toffee flavors peaking through. I gathered just a few, slight fruity notes from the Cascade hops and orange peel. No Stupid Flu was Keeping Me Out of the 408k! 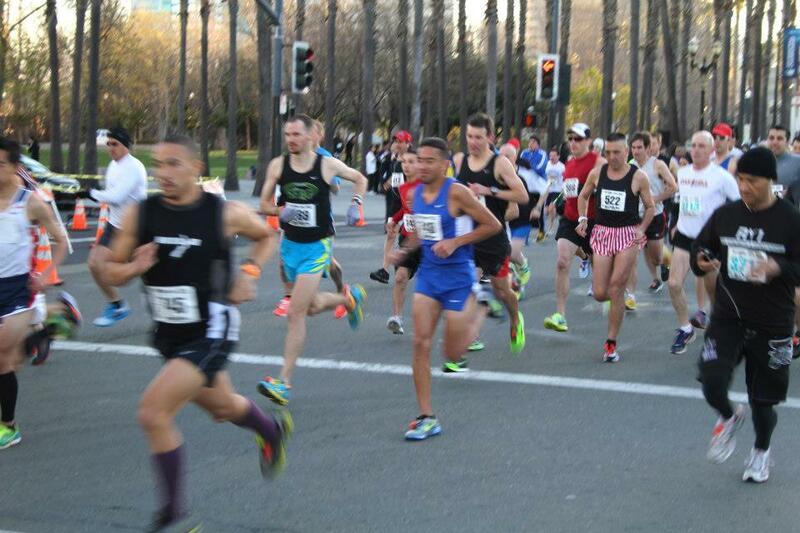 Last Thursday afternoon, it wasn't looking good that I'd make it to the starting line of the San Jose 408k. The race is 8 kilometers, or five miles, not 408 kilometers (408 is the San Jose area code) and started from the HP Pavilion and finished at San Jose's upscale Santana Row Mall, benefiting the Pat Tillman Foundation. I came down with this horrible flu which pretty much knocked me out for a couple days. I'll spare you the gory details except to say it involved headaches, a slight fever, and lots of urgent skedaddling to the bathroom. But by Saturday, I was feeling much better and my condition had, um, solidified, and I think "Hey let's give this race a go." I went in with no high expectations, and certainly didn't want to kill myself. But I'd rather run a race when I'm a little under the weather than stand by and watch it. So without further ado, here's a mile by mile run down of what was going through my head each mile of the race. Hey, I don't feel so bad. And whoever you are cranking out the Chuck D and Flavor Flav jams, thank you!!! Keep working the middle miles! That's the key to a successful race! C'mon! You can hang in there for just a couple more miles. That's right, the last mile was pretty tough, with my being less than 100% finally catching up with me, and was really dragging the last mile before gathering myself for a decent finish through Santana Row Mall. This despite the fact the last mile was "The Mariachi Mile" where three Mariachi bands were assembled along the finishing stretch. 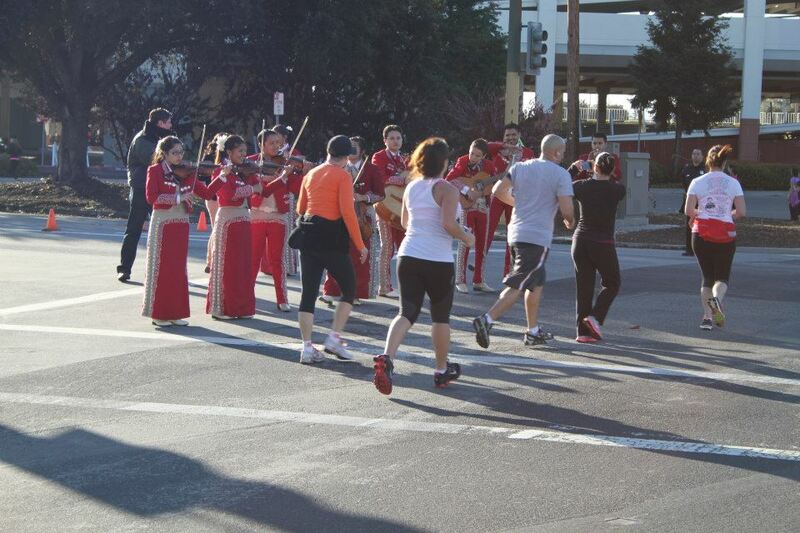 While I appreciated the Mariachi bands, giving them all a little fist pump salute as I ran by, I could have really used some more Chuck D and Flavor Flav. Despite straggling in over the last mile, I finished with a time of 32:02, or 6:27 per mile per, good for 4th in the old guys 45-49 age group. Since this race was intended as a tune-up for the Santa Cruz Half-Marathon in four weeks, this plan when I signed up for this race was to get a five mile run at a pace significantly faster than half-marathon goal pace. Since I don't expect to be going much faster than 6:45 per mile pace at Santa Cruz, I'd say "mission accomplished". And that called for a beer, even if it was only 9:00 am. Rosie McCann's Irish Pub held the race after-party, and it didn't take long after the first finishers crossed the line before the place was jumping. As much as I would have liked to savor malt-hop balance and flavor profile of the Sierra Nevada Pale Ale I ordered, I was too drained to really think, and sipped it slowly down while watching English Premier Soccer on the big screen TV with all the festive commotion around me. On the way back home, I stopped at Campbell's Psycho Donuts for a Dead Elvis, a donut stuffed with banana pudding topped with bacon, with peanut butter and jelly icing heavily drizzled over all of that. Trust me, they're great and do not taste anywhere near as heavy and clunky as you would expect. The Dead Elvis Donut seemed to go well with the bling-like finishers medal that Elvis would most certainly approve of. Just four more weeks until the Santa Cruz Half-Marathon!